Dutch commercial vehicle manufacturer DAF Trucks has hired Urban Fabric Events to organise and host a series of B2B events in the North West of England. 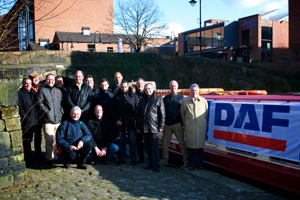 The agency was commissioned by Dusseldorf-based travel firm Congress International and has already run a technical tour of DAF in Leyland, Lancashire and an introduction to the industrial heritage of Manchester with a delegate group comprising 20 VIP truck dealers from across Germany. Urban Fabric Events has also been briefed to organise further visits over the course of the summer and throughout 2013. John Harding, Urban Fabric Events’ director of sales and development, said: "We’re excited to be working with DAF Trucks German and had fun implementing their first, three-day visit. It was our objective to show them the history of Manchester, which worked fantastically well since it is the birthplace of modern transport logistics."